The napkin rests on the lap till the end of the meal. Don’t clean the cutlery or wipe your face with the napkin. NEVER use it to wipe your nose! In many formal dinning situations in Dhaka, there is confusion regarding what belongs to whom. Often one finds his/her glasses are occupied by the neighbors, or the chicken claimed by the next person. This happens because very few are taught formal dinner etiquettes. While it may be possible to survive locally, it becomes a source of major embarrassment when travelling abroad. Therefore, it is not enough to be only well-dressed, it’s equally, if not more, important to know the social etiquettes. Many of the blog’s readers will already know these “rules” and these posts are not targeted at them. These etiquette posts are for those young professionals that aspire to be familiar with the western etiquettes. 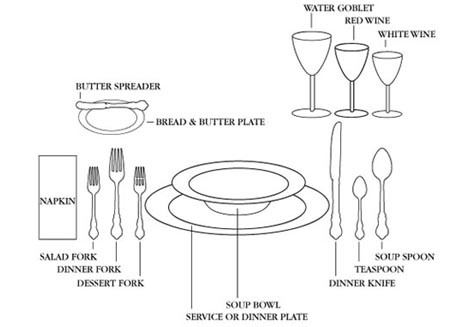 Here’s the Silverware and dinnerware rule: Eat to your left, drink to your right. Any food dish to the left is yours, and any glass to the right is yours. American Style: Knife in right hand, fork in left hand holding food. After a few bite-sized pieces of food are cut, place knife on edge of plate with blades facing in. Eat food by switching fork to right hand (unless you are left handed). A left hand, arm or elbow on the table is bad manners. Continental/European Style: Knife in right hand, fork in left hand. Eat food with fork still in left hand. The difference is that you don’t switch hands-you eat with your fork in your left hand, with the prongs curving downward. Both utensils are kept in your hands with the tines pointed down throughout the entire eating process. If you take a drink, you do not just put your knife down, you put both utensils down into the resting position: cross the fork over the knife. Asian Style: In Asian countries like Thailand, Laos, Cambodia, Bangladesh, India where rice based food are the main food, it is appropriate to eat with the spoon in the right hand and fork in the left hand. Once used, your utensils (including the handles), must not touch the table again. Always rest forks, knives, and spoons on the side of your plate. For more formal dinners, from course to course, your tableware will be taken away and replaced as needed. To signal that your are done with the course, rest your fork, tines up, and knife blade in, with the handles resting at five o’clock an tips pointing to ten o’clock on your plate.